On Thursday, we had our Chicago blogger meetup! It was so super fun. We chatted and ate and had a great time! If you have a chance to go to a meetup where you live, don't be nervous. You should go and have fun! Here's a picture of some of us! Thank you Melissa, Nicole, and Becky for organizing the meetup, and thank you Mel for taking care of the picture for us!! I look super tan somehow... it must be the lighting. Definitely not that tan in real life. Haha! And in other news.............. less than 6 hours until the Bachelorette finale! 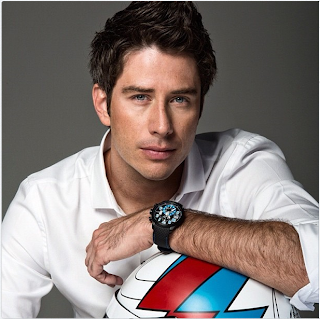 I am totally Team Arie. I mean, come on. And speaking of Team Arie... if you are a real fan, you can buy a Team Arie shirt and 100% of the proceeds go to fighting drug and alcohol addiction. I think that is great! Just a tip for you....... don't type in Team Arie dot com with no spaces........ you don't want to go there. Your meet up was a good-sized group. Probably a lot easier to talk to everyone and not feel left out. Looks like fun! Loved reading your post today. So glad you had fun at the meet up! Aren't they just the best?? Looks like yall had fun at the meetup!